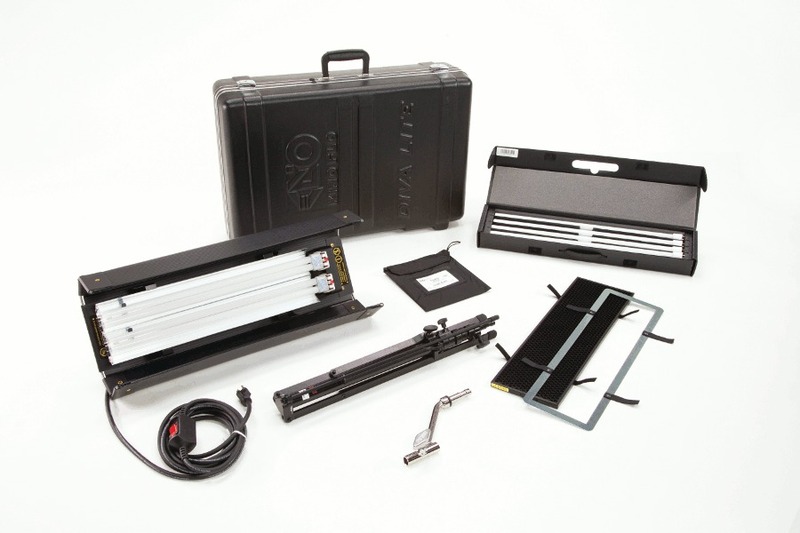 The Diva-Lite 201 is a soft light sources ideally suited for Television or Film documentary shooting styles. The units provide a broad, soft and diffused light. As a cosmetic light source they are ideal for news presenters reporting from locations around the world. It's compact size and rugged lightweight nature make them well suited for travel. The Diva-Lite puts out a broad soft wash of light. The drop off is like the light off of a bounce card. For this reason it is most effective in close proximity to the subject. By being close, the light is softer and easily controlled with the built-in barndoors and detachable louvers. This instrument is proving to be very popular for interviews. It is small enough to travel easily and is light enough to rig onto lighting stands or grip arms. An interview can be done with as little as a single Diva-Lite 201 and a bounce card. Diva-Lites operate on Kino Flo True Match 55W compact fluorescent lamps. Daylight balanced (KF55) and tungsten balanced (KF32) lamps are available. Light level control is established through an onboard dimmer. An in-line power switch controls the power. Louvers provide control over the spread of the light. The Diva-Lite is an efficient soft light compared to conventional studio fixtures. The Diva-Lite 201 is brighter than a 500w studio tungsten softlight, yet draws only 600mA at 230VAC compared to 2 amps on the tungsten softlight. This is especially important when shooting on location and power availability is an issue. The low power draw is also an advantage when operating on battery inverter power sources. On the HMI side, the Diva-Lite 201 would be approximate to a 200Watt with a soft Dome. Lamp life of a compact fluorescent for the television and motion picture industry is determined more by its lumen maintenance than by its actual burn time. All fluorescent lamps display a lumen depreciation curve. This means that over time the light output gradually drops and lowers in color temperature. A lamp may be rated at 10,000 to 20,000 hours, but its useful light quality is shorter. It is realistically more in the 2,000 to 2,500 hour range. All fluorescent lamps require some "burn in" time before they operate at their rated Kelvin temperature and brightness. For dimming products, the lamps perform best after 100 hours of operation. Due to portable nature of the Diva-Lites, the lamps can be damaged from handling and transport before "burning-out". True Match lamps are formulated to correspond to the spectral distribution curves of film and video cameras as well as look correct to the eye. They are designed to match the colors from quartz units or daylight sources such as HMI’s. This gives the camera operator the option of mixing quartz hard light sources with fluorescent soft sources. Most lighting designers want the ability to use both qualities of light to enhance the set. Architectural lamps are designed to optimize government-mandated standards for lumens per watt efficiencies (energy savings targets). In order to achieve these standards, the lamps contain high levels of light in the green spectrum, which our eyes don’t perceive as inaccurate. Film and television cameras do record this added green. For example, green renders Caucasian skin tone as grayish and unattractive. The architectural lamps do not match with other studio lamps. They render colors inaccurately and make correction in post almost impossible. The lamps are correctly spaced to maximize light output and minimize heat. The reflector is vented in the back to increase airflow. The ends are open to minimize heat buildup. The power cord is oriented in such a manner that the lamp tips will naturally be in down position when fixture is operated vertically. The Center Mount is more flexible than a conventional yoke. A yoke limits orientation on two axes, tilt and pan. The ball center mount design enables the beam to be oriented at any angle. This allows the beam to be rotated and have the same effect as rotating a barndoor on a Fresnel. On location, lamps get to full color temperature in three minutes. When finished, turn off power and pack - No need for cool down period. The lamps can stay in the fixture for quick transport. Same fixture uses 55Watt compact 5500K (Daylight) and 3200K (Tungsten) lamps. High color rendering True Match lamps work well alongside conventional quartz lights or HMI's. Kino Flo 55Watt compact lamps also available in 550nm green and 420nm blue for green and blue screen. Color gels do not burn out or fade due to low heat of fixture. Honeycomb louvers 90°and 60° give tremendous light control.